Ed was contracted to develop a complete brand solution for Hortpro from the ground up. As an independent, family-owned business located in Hawke’s Bay, this was a client passionate about crop protection and crop nutrition; providing top quality, high-value products to growers, orchards and vineyards. They deserved the full treatment. After the mandatories of a logo with associated assets were planted firmly in the ground, Ed went about applying branding to collateral including stationery, vehicle signage and apparel. From there a long-term strategy kicked in with a fully responsive website and regular email newsletters to take this start-up company from home base to a serious player in this highly-competitive market. The key objectives of the HortPro website were to promote crop protection and nutrition products and services, along with registration for regular email correspondence for news updates and delivery of industry knowledge. The design of the site needed to be simple and succinct, for the visitor to respond by calling HortPro’s phone number or registering for their newsletter. 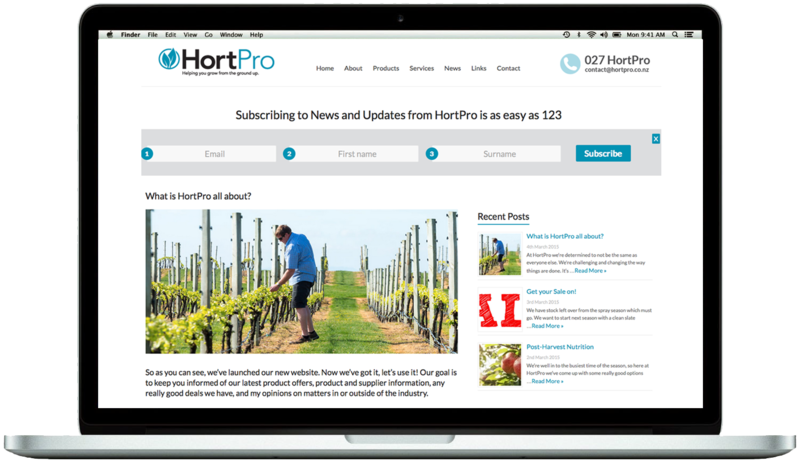 Off the back of the website launch, HortPro marketed their first email newsletter to a core audience of local horticultural growers. From an industry uptake average of 20.8% email newsletter opens, HortPro’s return was a whopping 74.3%. Add to that, clicks through to website links were 37.1% against an industry average of just 3.6%. Enough said. With Ed’s assistance, HortPro has hit the horticultural inputs market running and has been flat out since launch. Looking forward, HortPro intend to continue providing products and services on-demand to growers, and online deliver communications to help keep their clients in-the-know about what’s on offer in their industry. Long term, HortPro’s website is set to scale up its offering with online ordering to create client efficiencies. Essentially, HortPro are gunning to provide an even more complete solution to NZ’s horticultural growers. And, Ed will be with HortPro every step of the way, helping HortPro and their clients grow from the ground up.